Williams by canoe, in starlight, to buy yams: ‘ – Left home a little after midnight for Nasagalou in our canoe intending to purchase yams to set, and return by the next tide. Before I had got my trading finished a messenger came into the village where I was and informed me as well as she could from shortness of breath that I was to return without delay as four English vessels had arrived, one of which was believed to be the Triton. I was not much startled by this information as, from my knowledge of the native habit of exaggeration, I did not credit the report to its full extent’. Runs barefoot 7 miles: ‘For a moment I hesitated, my shoes being about a mile and a half another way; but having ascertained the nearest route home I started off in the direction pointed out, and after having run over hill and dale for the distance of 7 miles I beheld, with feelings of a mixed and indescribable nature, four vessels near the S.S.W. entrance. I could easily distinguish our own; but was at a loss what to make of the rest. I found on inquiry that they were on their way to the New Hebrides in search of sandalwood, and had called here in hopes of increasing the number of Tonguese natives whom they had on board to serve as woodcutters. Death of Waterhouse reported: ‘Bro. C. had just returned from the Triton as I finished putting on a change of clothing, and brought us the..painful intelligence that our father, the much respected General Superintendent of these Missions, had gone the way of all flesh. We wept together, and felt that the loss was a great one. Who can supply his place? Who will be so much our father? Williams sales on Triton: ‘The Triton being in haste we endeavoured to complete our business on shore as speedily as possible and succeeded in getting on board and on our way two or three hours before sunset. Conversed with Capt Buck about New Zealand and Colonial affairs and learnt that Mr Cargill is expected soon’. 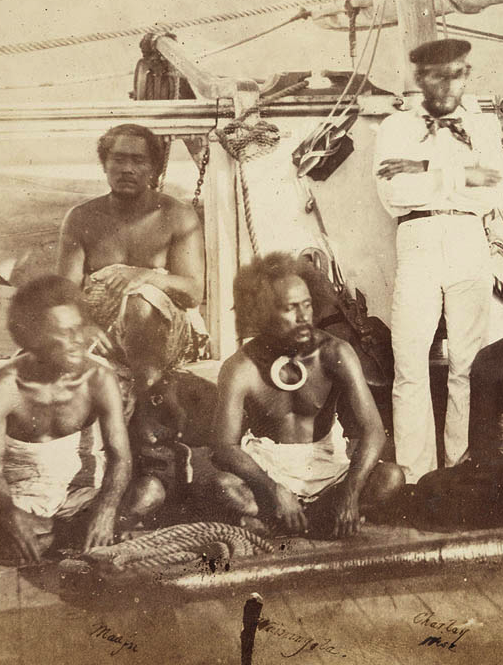 Trade goods wanted at Rewa: “Salt is readily obtained from sea-water, but the Feejeeans use very little; and they uniformly manifested dislike on tasting our salted provisions”. Tobacco wanted: “Spirituous liquors do not meet with more favour, although tobacco in one locality was making some slight progress”. Cooking – Fijians use earthen pots, not hot stones: “Cooking is not, as with the Polynesians, conducted exclusively by the use of heated stones, and in the open air ; but articles of food are steamed rather than boiled, in earthen pots.